Throughout the past 17 years that Barnes & Noble has served the USD community, we have loved being an integral part of student life and all that accompanies our students’ individual educational pursuits. 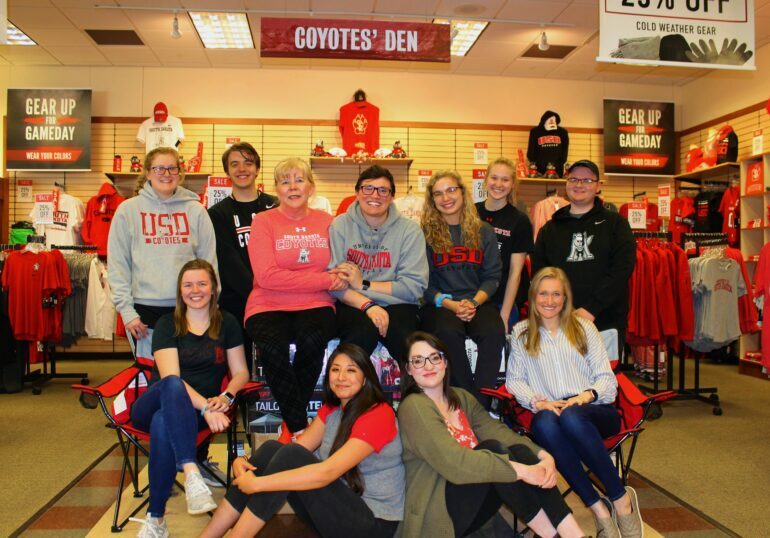 It is obvious to those of us who work for USD, that despite the nature of change that college campuses are accustomed to, there has been one constant throughout the many years– that Barnes & Noble has served this institution: Angela Miller. Writing this letter has proven difficult, as “thank you” feels like too small a sentiment to convey just how grateful we all are to have had Angela as our leader, mentor and friend. Angela’s commitment to this community has been unwavering and is mirrored in the many ways that she has dedicated her time and energy into putting the students’ needs first. Angela has put in some of the longest days working at USD. Arriving before the sun is up and often staying well into the night, Angela supports her students by ensuring that they get their books shortly after ordering them. She’s constantly thinking about our student-athletes, student veterans, jumpstart students and vocational rehabilitation students, working tirelessly to find ways to ease the financial burdens of all students. She has helped cut the costs of textbooks by getting professors to submit their textbook requests early so that the bookstore can source the cheapest copies for students before going to publishers. She spearheaded the First-Day-Access program, dramatically lowering costs for students enrolled in courses taking advantage of the program. Not only does Angela support the students through her work at the bookstore, she also supports Vermillion’s overall community outside of work. She has season tickets to the volleyball games and plays community volleyball competitively. She supports student organizations through donations and by attending their events. You can always catch her at Ribs, Rods, and Rock & Roll—supporting the community and busting a move. The general student body might know Angela Miller for her work at the bookstore, but we will remember her for the employee appreciation banquets she hosts and cooks for us, the support she gives us during our own student struggles, her compassion and drive to help others, as well as her ability to connect with us and her students here at USD. We will remember Angela for the love she has shown us during our most emotional and darkest moments, for her long hugs when one of us lost a friend and when USD lost a community member. Angela Miller exemplifies what it means to be part of USD’s family.